The multi-format AG-HMC80 camcorder records in both AVCHD (HD) and DV (SD) formats onto SD/SDHC Memory Card. 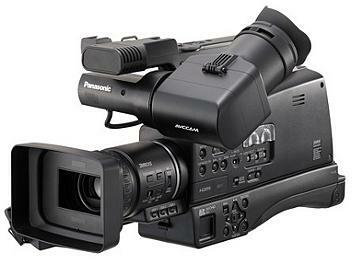 This tapeless camcorder features a 12x optical zoom lens, Optical Image Stabiliser (OIS), and a 1/4.1-inch, 3.05-megapixel (approx. 2-megapixels/effective image pixels), progressive 3MOS. The AG-HMC80 features a shoulder-mount design that enables stable shooting, XLR audio input (with phantom microphone support), and a BNC component/composite image output terminal as standard equipment, for smooth compatibility with professional systems. - Full HD resolution 3-megapixel 3MOS imager produces stunning 1920 x 1080 or 1280 x 720 AVCHD video with high sensitivity. - Uses MPEG-4 AVC/H.264 high profile encoding. - Records video in all four professional AVCCAM HD recording modes. - Records standard-definition DV directly onto SD cards in the AVI Type 2 file format. - Two wired remote control terminals (for zoom, focus, iris, REC start/stop controls). - 12X optical zoom and features a 40.8mm (35mm lens equivalent) wide-angle setting. - HDMI output (AVCHD only). - USB 2.0 (mini B-type devices). - Composite output (BNC x 1). - Analog component (BNC x 3). - IEEE 1394 output (DV only). - Built-in stereo microphone as well as a 3.5 mm external mic-in jack. - Two locking XLR inputs with switches for mic/line and +48V Phantom Power capability. I work in a commercial radio station and this camera will be used to film segments for online and to record artists who come in and perform live on air. It's a great looking camera with the pro look that is crucial to credibility. Plenty of great features and the ability to operate everything manually is outstanding. As for GlobalMediaPro, all I can say is wow! Paid on the Monday, delivered to my office in Australia on the Thursday, that's about as fast as it gets. Their communication is faultless, replying to every email within an hour or two (even on weekends) and they even phoned me once to address a question I had asked. Their direct debit-only payment system may make some people uncomfortable but I had no problems whatsoever. Price-wise, we were planning on using BH in the USA but the price difference was extraordinary. With shipping to Australia, customs and GST the cam from GMP came in at $1880, from BH it would have cost over $2700. That's 30% more! Once the camera proves its suitability we will be buying more and we will definitely use GlobalMediaPro. If you're still not sure, feel free to email me at newsdirector@bayfm.com.au. Excellent Service an very fast shippment. Camera is good and very good price. I will order another Items by Globalmediapro. Cheap Camcorder with good price. This is an OK entry-level HD camcorder. It is very useful for beginning videographers, as it allows you to manually control most of the important settings (iris, shutter speed, wide balance...). A notable exception is the ND filter which is fully automatic. The camera has two XLR inputs, which is useful if you're planning to invest a little more and buy a nice microphone (I bought Rode NTG1, which was delivered in the same box as the camcorder). This camera is quite big in size, which can be limiting (you need a really big camera bag for it - I bought Kata cc195pl and it barely fits). I guess it all depends on what kind of projects you want to use it for - this is an impressive-size camera so people will mostly assume you're professional media (which can be both good and bad). On the other hand, if you want to film in tight spaces, public transport and so on, look elsewhere. The camcorder doesn't sit that well on your shoulder (I used to do a lot of work with Canon Xl1s and I like the Canon design better) and having to raise the viewfinder in order to use the LCD screen is not practical at all. It is also the main reason why you will need such a big camera bag. Overall: a good bang for your buck. It is very disappointing with low light condition , very grainy Spacial y on black bkg. It is very noticeable,in bright light getting good picture quality,I am satisfied with Over all manual control of it. Is This Models drawback or is there any solution For it. HMC-80: costa poco, ma da anche poco in piu..
Il prodotto a primo impatto non sembra segnare per me un miglioramento qualitativo apprezzabile delle immagini rispetto alla mia vecchia 3CCD Panasonic HDC-SX5, da me dotata dotata di micro esterno direzionale e staffa a spalla, pagata solo 560 euro, ma che restituisce immagini HD sbalorditive, portandosi dietro solo poco piu di un kg. Alla faccia del 3MOS della HMC80, la HDC mi sembra addirittura superiore in condizioni di luce bassa, e non di poco..
Io ho acquistato la 80 per fare qualche servizio video con velleita professionale, ma consiglio di pensarci due volte prima di acquistarla se avete gia un apparecchio simile alla mia vecchia HDC che utilizzate solo per i video-vacanze e similari. La HMC-80 nella sostanza offre in piu solo alcune interfacce di tipo professionale e la messa a fuoco manuale, ma sulla spalla e sbilanciata e non monta neppure un obbiettivo LEICA. La cosa dove eccelle e invece nella "scena": con la HMC-80 non passerete infatti inosservati. Speriamo che usandola non mi faccia rimpiangere troppo la mia vecchia HDC-SX5. Quite a good camera. Clear picture, easy to use and I like the professional look. Not very good under low light but acceptable. No ND filter as well was a bit if a turn off. Also, the setback is the battery that will only last for +/- 2 hrs. Otherwise great product. I bought two HMC72's from GMP in August 2009 and they did well shooting many weddings. It was time to upgrade so I chose the HMC82 as my new cameras. I'm delighted with the performance. A lot of new external controls too so you don't have to fool around with menus!! The manual mode is awesome. Don't be put off by the 3MOS sensors either ..they behave well and the image is a lot sharper than the HMC72. The chips don't have any "jello" effect like other models and also no vertical image breakup either. If you are a Panasonic fan (I have owned then since 1982!!!!) then the HMC80 is well worth the money!!!! Kamera je super poslali mi misto 80 - 82 a jsem jeste vice spokojen. Dodani spolecne s DHL pres pul zemekoule za 2 dny jen cesti celnici tyden clili a pocitali DPH. Obchod s praskou bankou je pravy nemusite se bat rizika nebot vse sledujete na strankach globalmediapro. Doporucuji - kupoval jsem naprostou novinku a do 14. dnu jsem ji mel.